Obviously my VIP Blogs are not listed in any order of importance. If they were these two would be right up there toward the top of the list. Cliff and Charlene….that’s my Mom & Dad. I wish you all knew them. They’re two of the most incredible people you could ever meet. They’re now in their 80’s and live only a few blocks from us. I like that. I’ll go there at least a few times a week and have coffee and visit with them. They amaze me in that they’re still telling me stories that I’ve never heard before….and they can do it with nearly total recall. Now seems like a proper time to write them up as VIPs since just about three days ago they celebrated their 66th Anniversary! Pretty amazing when you think about it. That’s setting the bar up there pretty high for the rest of us Taylors’. Good job, Mom & Dad! There’s no way I could come close to telling all the good qualities they have…and the good qualities they’ve passed along to Mont and I. It’d take a good sized book to get that done. But for the sake of time and space, I’ll try to give you a little insight on ‘who’ they are. They have been the hardest working pair I’ve ever seen. Dad has always been a cattleman so we learned at a very young age to handle cattle and horses with the best of ’em. Dad had Mont and I doing things that most men couldn’t do when we were just little kids. We learned how to do it right. When I was 12 I started riding colts for other people for pay. I did that successfully, at least at some level, for the next 25+ years. Most of our lives were spent on a ranch. It was a great life. Besides handling every aspect of the cattle business (receiving, shipping, gathering, doctoring, buying and selling) we learned to build fence, repair windmills and water gaps and about every other thing you need to do to run a ranch the right way. Mom was the best! I can remember as a little kid, her pulling broomcorn to help make ends meet. She’d come home tired, dirty and worn out but always managed to get us one heck of a supper cooked, without fail. Later on in our rodeo days there were many times we’d roll into the ranch in the middle of the night with a carload of buddies. She’d get up even if it was 2 am and cook us up some chicken fried steak, french fries and gravy. There are retired rodeo guys all over the United States and Canada who spent time at our house and who have the greatest amount of respect for my Mom & Dad. Oh, and incidentally, when we’d come in to the ranch in the middle of the night and have that great meal….Dad was always gracious to let us sleep in ’til 5:30 or 6 in the morning before we started whatever project he had planned for the day…….and there was always a project! Most serious ranchers work their cattle according to the Zodiac signs. Dad always said that when there were a couple of carloads of rodeo friends at the ranch……that the ‘signs’ were right! They sacrificed, and went without, to haul us to junior rodeos all over Texas, Oklahoma and Kansas. They gave us a ‘leg up’ that way and enabled us to have a successful career in professional rodeo. We were both inducted into the Texas Rodeo Cowboy Hall of Fame in 2008. And in our acceptance speeches we made sure that they got the credit they deserved. In all actuality……they’re the ones who should’ve been inducted. I could go on and on with those kinds of things but they gave us far more important things than teaching us cattle and ranch work. In my 62 years I haven’t seen them do one person wrong. I have seen them wronged plenty of times but they always handled it with class. They’ve lived their lives with the highest degree of integrity. Their ‘word’ has been their bond in the truest sense of the term. We didn’t go to church but they somehow instilled in us that God was ‘real’.…..and that He was good! All those things are important but the most important thing of all is that we were loved……in word…..and in deed. We let them down plenty of times with some of the dumb stuff we did….but they hung in there with us, always having our back and always believing in us, and never, ever wavering in their love. In the final analysis I’d say if, when it’s all over, if I’ve been half as good a person as they have been…..I’ll have done pretty decent. Cliff & Charlene Taylor, VIP’s to anyone who’s had the good fortune of knowing them! I first met Art Harris in October of 1988, our last year on the ranch north of Allison, Texas. I had been taking care of 2500 head of cattle for Art’s cousin from Munday, Texas. Art came down that day that we gathered the cattle. We were busy weighing cattle all that day and I didn’t get to visit a lot with Art ……but enough to know that I liked him a lot. Art had grown up in Seymour, Texas and was one of the best athletes to ever graduate there. He played football and basketball where he was a standout in both sports. He’s still known, admired and idolized around those parts just simply as, Art Lynn. When we moved across the line into Oklahoma and we needed to find a bank I looked for Art…..and after I found him he would be our banker for the next 27 years. In that time we became very good friends. I’ve said often that Art was the last of the ‘old time’ bankers. That kind of banker that believed in you as a person and loaned money based on that premise. In fact, he actually loaned millions of dollars on exactly that! We bought a several houses (rental properties) over the years and just called Art after the fact. It was never a problem. By 1997 Art had become a VP and loan officer and was heading up the branch in Sayre. We started Trinity Fellowship in a home and then moved to a small building on the south end of town. When we grew to about 35 people (on a good day) we started looking for another place. We landed on Walter Merrick’s property two miles east of town on I-40. The Merrick family was gracious to allow us to use the property with no rent from ’92 to ’97…..which was a good thing because we had no money. The property became available for purchase and there were some very interested people who had the means to buy it. But we felt that the Lord wanted us to have the property. After a lot of prayer we decided we should try to buy. I remember vividly sitting in Art’s office and telling him that we wanted to buy the property. Art said “Yes”, and the rest is history. Why do I tell that story?? I tell it because Art Harris believed in us when there wasn’t much to believe in. In two years we had the property (100 acres on I-40) totally paid off. Art started coming to church with us along about that time and our friendship deepened even more. A couple of years ago Art was diagnosed with cancer. It was a tough diagnosis with the doctors giving him 6 months to live. I was there at his house when he arrived from Oklahoma City after getting the discouraging news. We prayed and he vowed to fight it…which he did. There was a mixture of reports from the docs over the next year, some good …..some not. Three of us went to Dallas in December to watch the Texas state football finals games. Art tired easy and didn’t have a lot of energy but it was a great trip, nonetheless. It was only a few months later that he was promoted to heaven. When I look back over the years since I’ve known Art it’s very obvious how much he’s helped the Taylor family……and the Trinity family, as well. There’s hundreds of stories out there just like mine….of people that Art believed in. and gave them a ‘leg up’. He was my Friend! There’s no question about it for me…..Art Harris is definitely a VIP! …….and you wouldn’t have to look far to find a lot of other people who think so too! I have an unlimited pool of people to write about when I write about VIP’s. There’s been so many people throughout the course of my life that have had a profound effect on me in one way or another. I’m grateful for the things I’ve learned from all of them and grateful for the deposits they’ve made into my life. Monty Taylor, or ‘Mont’ as I’ve called him since we were little kids, is my brother (there’s just the two of us) but he’s been my best friend since the day he was born 59 years ago. Oh, we had our differences when we were growing up like all siblings do but neither one of us ever tolerated anybody else mistreating the other one. We’ve been ‘partners in crime’, so to speak, all these 59 years. We’ve had about every kind of ‘wreck’ with horses, cattle and bulls that you could ever imagine……and some you just couldn’t imagine no matter how hard you tried. We’ve even had a couple of car wrecks; one when we were headed to school in little Allison, Texas and hit a patch of black ice and rolled my pickup up on the side. Another the night before I got married. We’d had way too much to drink and ran off a bridge on the Oklahoma line. It was a miracle that me or Mont….or Ken Henry weren’t killed. Then there was the time when I was about a 3rd grader and Mont hadn’t started to school yet. Dad had gone to shoe horses at a neighboring ranch and he didn’t let us go. We weren’t happy about that so we got on a big ‘ol tractor. We somehow got it started….and it took off. I bailed out! (Sorry Mont!) But Mont rode ‘er on out…until it hit a cattle guard and spun out ’til it died. It could’ve easily killed us both! And, let’s just say that Cliff Taylor wasn’t too happy when he got back to the ranch and the tractor had run through the fence. We had no choice but to be cowboys and we took to it full blast. 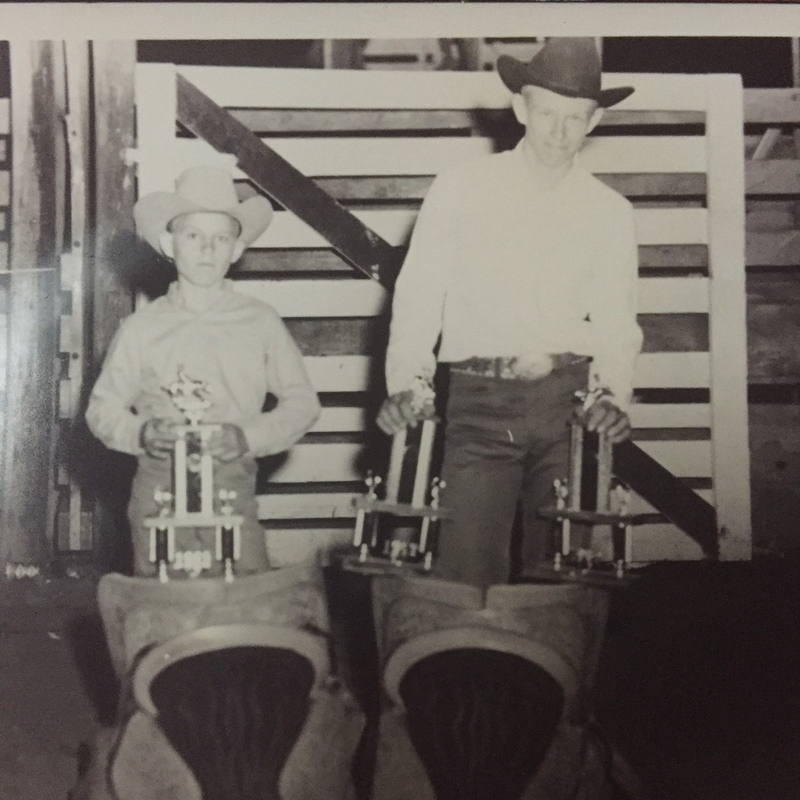 We started our bull riding careers on the arm of the chairs and couches in a little one bedroom ranch house on the Washita River 35 miles SE of Canadian, Texas. We graduated from the chair arm to riding on the back of our dad on hardwood floors. They don’t call ’em hardwood floors for nothin’! You learn early on to try as hard as you can to not get bucked off and bang your head off the hardwood. We went to our first rodeo when I was 8 and Mont was 5. We were determined to practice riding but we had no bucking chute….but we made do! When we’d see the dust from Dad’s pickup go over that last hill….we’d gather every cow, calf and bull we had and ride every single one of them. We’d run ’em in a big pen, rope ’em, snub ’em to a post, put our rope on ’em….and the rodeo was on!! Dad started gettin’ kinda suspicious when the cow herd wouldn’t even come in when he fed….and when he noticed how bad we were bruised and skinned up!! Rodeo was a pretty important part of our lives for the next 20-25 years. We rode in every major rodeo throughout the United States and Canada…..and won money at most of ’em! We were both inducted into the Texas Rodeo Cowboy Hall of Fame in 2008. Mont Taylor is a ‘Man’s Man’! He’s a man of his word, treats every single person with dignity, hard worker, great husband and Daddy, has a thousand really good friends and I doubt if he has an enemy on the whole planet. He’ll ‘loosen up’ with the best of ’em….but wouldn’t ever cause anybody any harm. We live 300 miles apart but I talk to him a couple of times a week. I have a ton of respect and admiration for him. His impact on my life has been immeasurable…..Mont Taylor is definitely a VIP! !